Crankshaft and fuel pump locking tools - 1.9TDI/SD, VW/Audi/Seat/Skoda. VW, AUDI, SEAT SKODA 4-ZYL, TDI PD engines. 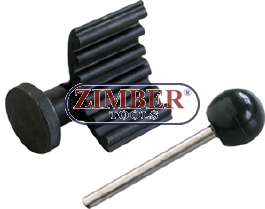 Injection pump pulley timing pin. To lock injection pump drive pulleys. VW-AUDI, SEAT, SKODA, 1.9D SD, SDI, TD AND TDI. VW-AUDI, FORD, SEAT, SKODA, TDI PD engines. Blocaj pentru ax cu came motoare VW - 1.9TDI / SD, VW, Audi, Seat, Skoda - ZIMBER TOOLS.